Why is this day different from all the other days? Because today is June 10th and I can officially renew my AT&T contract. Decisions to be made. I have Hannah’s iphone here but I don’t know her password so I can’t play with it. I’m seriously thinking of getting one. Carol and Cheryl have an iPhone. I really feel like I should get one too. Drew thinks I need one, Hannah thinks I should get one, and apparently Steven Ezra doesn’t think I should get one because I’ll use it too much. After all, I am a valued customer. Will I use it too much? I can’t be sure. But just think, I can check my email all day long from anywhere! I won’t have to run home periodically during the day just to see who emailed me. And with the price of gas that is quite a savings. I can find out where the local Starbucks is — even though I have been totally disappointed in their iced latte and cappuccino. What do you think happened? The other day I ordered an iced latte and I asked for less ice and milk, “It’s okay if the cup isn’t filled to the top. I just want to taste the espresso,” I was sure to mention. But still it was weak. Not happy, not happy at all. A few months ago I ordered a tall cappuccino and it was so milky I poured it out. I should have returned it but I was in the city and rushing off. I used to like their coffee but I find their espresso not as strong and satisfying as it once was. So, where was I. Ah, yes, the iphone — should I stay or should I go — to the AT&T store to pick up my new iphone? Well, for now, Hannah wants me to wait til she gets back so she can come with me to the store. I’ll wait til she gets back. Sometime this week she’ll be on the Greek Island of Lesbos and I will still be using my Nokia flip phone. 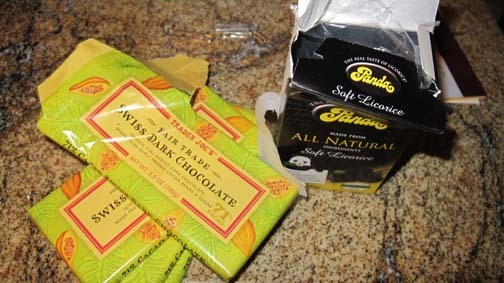 A heavy dose of black licorice and dark chocolate will keep me happy until Hannah gets home. Bought some good looking salmon steaks and wild baby dandelion greens yesterday for dinner. I’ve really been in a salmon kind of mood. Marinated the salmon and then Drew called and said, “I’m so full. I didn’t even eat my salad. There was food in the office. What are the dinner plans?” “Um, uh, I marinated the salmon, cut up some veggies but if you are not that hungry I’ll save it for tomorrow.” “But the fish is marinated,” he says. “Yeah,” I mumbled, “and the recipe says to marinate at least an hour and can be marinated overnight. I’m home alone, it’s thundering, lightening, hailing, pouring. I’m clutching my new Mag-Lite flashlight and stuck in the house with not even one potato chip!!!! Come to think of it I do have some bon-bons in the freezer. And I also have peanuts and a dark chocolate bar. That should carry me into the next day. This morning I was lost. I had no salad to make. No chopping, slicing, and dicing for me again. I’m losing it. I need to use my knife. I signed up for a cooking class in Seattle on Wednesday — Soup and Salad Lunch. Tonight we ate our salmon steaks, brussel sprouts, dandelion greens, and cauliflower with leeks. It was good. I was happy and so was my stud-hub Drew. Phone rang early this morning. Didn’t recognize the name but answered anyway. It was a call telling me that one of the people I deliver Meals on Wheels to had passed away. She didn’t want to tell me when I picked up the meals on Friday — she knew it’s better to tell me right away. I’ve been delivering meals to this woman for over 6 years. She greeted me at the door, always wearing lipstick and dressed. I made sure she was my last stop each week and we would sit and chat for an hour. She had lots of stories to tell and was glad to be alive. She was 90 and in good health, had a boyfriend and kept up on all the latest movies — until she fell in late December and broke her hip. I thought she was going to be the one who made it through but stuff happens and nothing went as smoothly as hoped. When I saw her last week she tired easily but in her words, “Hey, I’m still here.” And she was thankful for that. I’m glad Hannah and I waited for half an hour on her stoop 2 weeks ago. She had a doctor’s appointment and left us a note, “Please wait for me. I don’t want to miss your visit.” She drove up in the car with her family and they all helped her into the house. She was thrilled to see us and made us wait til she could catch her breath. The call this morning caught me off guard. It wasn’t a total surprise but then again it was. The problem with death is it’s so final . . . regardless of what you see in the movies . . . there is no turning back. Tomorrow I’ll deliver my meals but I think it may be time to take a break. I’m almost done with my year commitment to Literacy of Nassau County. I think I’ll end that too. In vicki-time it’s going to be a new decade in April. Think it’s time to start anew. A new what? Not sure but it’s time. Found a good mood booster: A Trader Joe Vanilla Ice Cream Bon-Bon on a dish and microwaved for 9 seconds. The dark chocolate top lifts right off and if you turn it over quickly, it will be filled with melted ice cream ready to be sipped. Then finish it off by eating the chocolate cookie crust stuck to the plate and covered with drips of melted ice cream. A lick of the plate and no need to wash the dish! How’s that for going green? Anyone interested in coming over for dessert? I have clean plates!